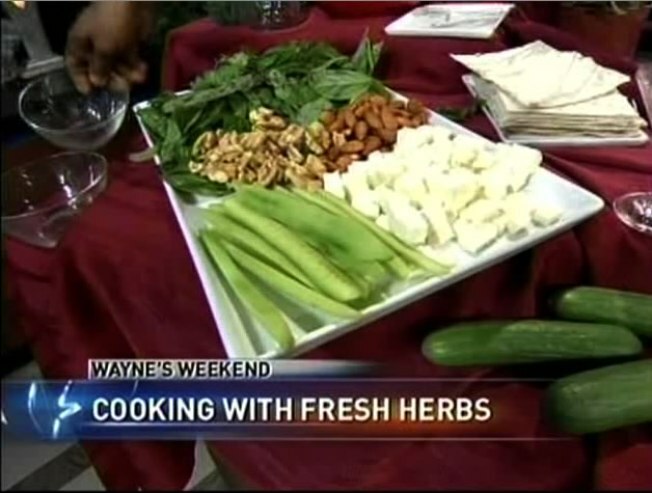 Wayne shares tips and recipes for using the fresh herbs you’ve been growing all summer. I received another suggestion from a facebook friend, Laura Savage, to share ideas on how to use the fresh herbs that many folks have been growing this year. I’ve provided full recipes for two of the ideas below and a general description of a few others. I’m a big believer in experimenting with combinations of flavors and quantities to find the right mix that fits your individual tastes. So, use some of these ideas as guides and make your own recipes. If you have time, put the walnuts and almonds into separate containers and fill with warm water. Let them soak for 3-4 hours and then drain and pat dry just before serving. In a large bowl, combine herbs and toss. Place herbs on a large serving plate. Place feta cheese, cucumbers, nuts and lavash on the platter as well. To server, have guests put a bit of the herb mix on a piece of lavash. Add additional ingredients, according to taste, and roll lavash around them to eat. Pour water and sugar into a large saucepan and bring to a boil. Stir until sugar has completely dissolved. Add lavender buds, remove from heat and cover for 15 minutes. Transfer liquid to a container and allow to fully cool. Add lemon juice and refrigerate for 5-6 hours. Strain to remove lavender buds and then freeze liquid according to your ice cream maker’s directions. Serve with a bit of mint for garnish. One of my favorite summer dishes is a simple caprese salad: sliced tomatoes, mozzarella and fresh basil with a bit of olive oil drizzled on top. As an alternative, try making a panini sandwich by placing the ingredients above between two slices of bread that have been brushed with a bit of olive oil on the outside. Toast the sandwich in a panini press or in a skillet. Saute sliced garlice and whole chili peppers in olive oil in a large pan until tender. Add freshly cooked pasta and toss to combine. Transfer pasta to a serving plate and sprinkle fresh oregano leaves (stems removed) and freshly grated parmesean cheese on top. Prepare basmati rice according to package directions. But, just before covering the pot to steam the rice, add in 3 tablespoons of fresh cilantro and 1 1/2 tablespoon of freshly chopped dill for every 1 cup of rice. Add a pinch of freshly ground cinnamon just before serving. Finely mince 1 tablespoon of shallots and 1 tablespoon of fresh sage (or tarragon). Mix into 1/2 cup of softened butter until thoroughly combined. Put mixture on a sheet of wax paper and roll up to shape into a log about 6" in length. Refrigerate until firm. To use, slice about 1 tablespoon of herb button and place on a steak right off the grill and serve as butter melts. Try making other versions using other herbs (or combinations). A simple way to accent the flavor of leftover dishes, like chicken salad or tuna salad, is to make a wrap with additional fresh herbs. Take a tortilla or mountain bread and soften it either in a hot skillet or the microwave. Spread about a cup of leftovers salad on top and add a few tablespoons of fresh herbs, like basil or oregano (or a combination). Roll the wrap around the ingredients and enjoy. Thanks again for all the comments and suggestions. If you have any additional questions, please send me an email at wayne@waynesweekend.com or on twitter @MrDomesticDiva.